Designs for the national sites and national parks honored on the 2015 America the Beautiful Quarters have been published by the United States Mint. The United States Mint on Thursday, December 8, released line art imagery of the final designs for the 2012 America the Beautiful Quarters®. They include four national park quarter designs and one featuring a national forest. The five quarters are due to be released at intervals into circulation next year. 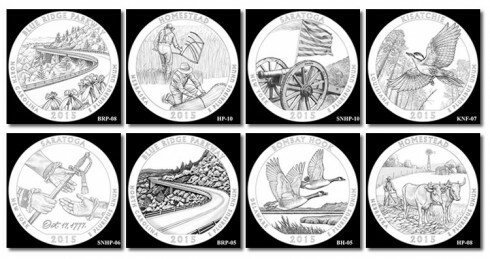 The U.S. Mint has formally revealed the final designs for this year’s four 2010 National Park Quarters and the first National Forest Quarter. The United States Mint will reveal the final designs for the 2010 National Park Quarters at the Newseum Museum in Washington, D.C., on March 24, 2010. This year’s quarters kick-off the first year of the America the Beautiful Quarters Program, which will feature 56 new designs on the back of the quarter-dollars at a rate of five per year until 2021. The quarters honor a National Park or National Site in each state, the District of Columbia and the five U.S. Territories. Candidate designs for next year’s 2011 National Park quarters are about to get looked at by the Citizens Coinage Advisory Committee, the United States Mint said in a press statement that invited the public and media to attend a design meeting on Jan. 26, 2010. 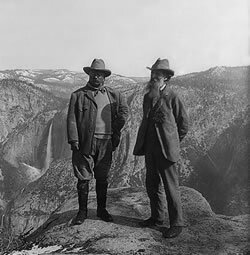 The CCAC is tasked with reviewing all US coin designs and themes, and then forwarding their recommendations to the US Mint Director and Secretary of the Treasury, who will make the final selections for all the commemoratives in the America the Beautiful Program, which honors national parks and other national sites through to 2021. 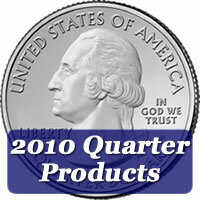 2010 is the inaugural year for America the Beautiful Quarters Program which will feature 56 rotating reverse designs for the next eleven years. These designs are to honor national parks and other national sites in each state, DC and US Territories. The United States Mint’s process for creating the new quarter-dollars includes the production of several candidate designs featuring themes for the selected national park or site. These are then submitted to the Secretary of the Interior, the chief executive of the host jurisdiction (State/District of Columbia/Territory), the Commission of Fine Arts (CFA), and the Citizens Coinage Advisory Committee (CCAC) for review and comment. The candidates for the 2010 National Park Quarter Designs have already passed this step, and are at the next phase where the U.S. Mint Director makes the final recommendations to the Secretary of Treasury, who is tasked by the America’s Beautiful National Park Quarters Dollar Coin Act of 2008 (Public Law 110-456) to make the final design selections. Roosevelt to replace Washington on Quarters? Consider replacing George Washington’s portrait on U.S. quarters with an image of Theodore Roosevelt, members of the Citizens Coinage Advisory Committee (CCAC) unanimously recommended in their Jan. 27 meeting, according to Numismatic News. 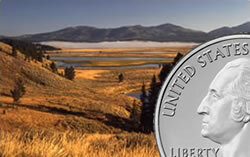 Information about the National Park Quarters has been minimal, as should be expected for much of 2009 given the United States Mint will not begin issuing the quarters until 2010.